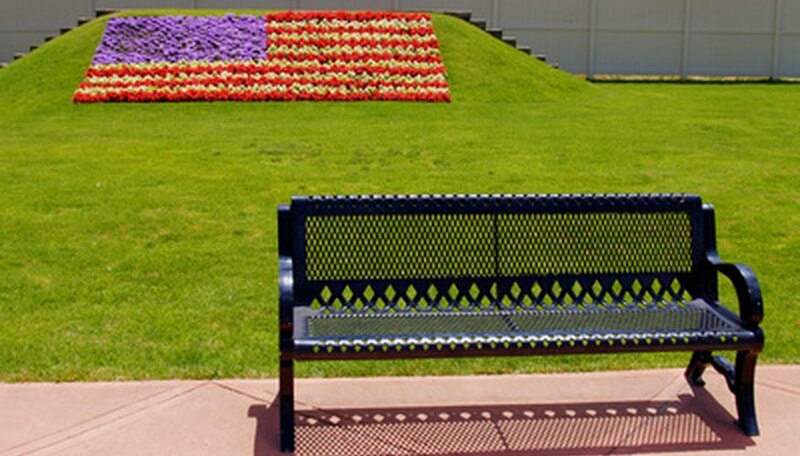 Designing a flower bed with a patriotic theme takes a bit of planning, but the results are well worth it. Locate the flower bed in a sunny area. Consider how the design will be viewed. A very large design needs to be viewed from above or be planted on a hillside, otherwise the design gets lost because it's difficult to see it all at once. Smaller designs, such as a flag that's 3 by 5 feet, 6 by 10 feet, or even 12 by 20 feet, can be planted on level ground. Measure the area for the patriotic flower bed and outline it with a hose or spray paint. Dig up the bed, removing rocks, weeds and other debris. Add soil amendments if necessary. Most new beds could use a healthy dose of compost. Add a 4-inch layer and work into the soil. Select flowers of the same height. The design will look odd if some of the flowers are 3 feet high and others only 6 inches high. A good choice are petunias, an annual that flowers freely on bushes up to 18 inches high. Petunias at the peak of their bloom are literally covered with flowers. Another advantage is that petunias come in nearly every color, including blue. Mark the rows of the flag with string attached to stakes. Section off the rectangle within the flag that has the stars separately. The U.S. flag has seven rows of red and six rows of white. Plant the rows beginning at the back of the flower bed moving toward the front of the bed. Space petunias 8 inches apart. That's closer than recommended, but the flowers will fill in the stripes quickly. Plant blue petunias as the background for the stars. Purchase 50 white plastic stars on stakes or hot glue them to stakes. It is possible to use white petunias as the "stars," but it would be difficult to have the required number (50) in a small bed. Decide how big you want the bed to be. A circle with a diameter of 8 feet is a good size. It's big enough for the design to show clearly but not so big it takes a huge number of flowers. Pound a stake in the middle of where you want the circle to be. Attach a 4-foot length of string to the stake. Pull the string taut and mark the circle by moving around the stake. Scratch the ground with a hand shovel to mark the circle. Dig up the bed as in the first design. Draw a smaller circle inside the first circle by shortening the string to 3 feet and marking around the stake. Mark it with baking flour so you can clearly see it. Cut a star-shaped template out of paper or cardboard that fits inside the smaller circle. Place the star shape inside the inner circle. Mark the outline of the star with baking flour. Remove the star shape template. Plant red dianthus in the outer circle and blue lobelia in the inner circle but outside of the star shape. Plant white alyssum inside the star shape. Trim the flowers so the edges of the star are sharp. Annuals are a good choice for designs because they grow quickly and flower for most of the season. Stick with simpler designs. Complicated designs will have uneven edges.